"It's yours, use it, protect it, share it"
"Most informative and up to date outdoors website on the planet"
[Some funny stuff & odd-ball stories too] Enjoy! How do I turn in a Poacher? Who are these people? On what planet do they live? Home This is a brand new page on Outdoors Niagara ~ More to come! While U.S. troops in Iraq spend much of their time searching for high level insurgents, some soldiers at Baghdad's Camp Victory try to catch another type of "big one." They fish in the lakes surrounding Saddam Hussein's palaces. After five years, it's become a tradition — soldiers on their way out hand fishing rods to newcomers. ALBANY, N.Y. - Conservation officials say more than 15,000 youngsters got licenses this year to hunt deer and bear in New York. New York's new law, meant to help reverse a decline in the numbers of hunters and increasing numbers of deer, allows teens ages 14 and 15 to hunt big game with a firearm when supervised by an experienced adult hunter. Previously, children 12 to 16 could hunt small game with a gun or longbow, and 14- and 15-year-olds could shoot big game with a bow. Preliminary Department of Environmental Conservation reports show the new licensees killed almost 3,700 deer in 2008. The agency says hunters took more than 217,000 deer in 2008, approaching the 219,000 killed last year. They killed almost 1,150 bears this year, compared with about 1,100 in 2007 and almost 800 in 2006. The Arizona Game and Fish Commission recently revoked the privileges of three Utah residents for spotlighting wildlife (black-tailed jackrabbits), littering, and hunting without a license on the Arizona Strip. During their April meeting, the Arizona commission revoked the individual hunting, trapping, and fishing privileges of Stephen Holt, Blake Obershaw, and Gregory Holt for five years. The three men were also civilly assessed $500 each for the loss of the wildlife they took illegally. In addition, Arizona is part of the nationwide Wildlife Violator Compact, meaning any individual that is revoked in the state also loses their hunting, trapping and fishing rights in 29 other member states. Minnesota's conservation officers have countless tales of fish-law violators just as all conservation officers in the country and the phony stories they concoct to try to get off the hook. One angler said he thought he could fish with more than one line because he was using different lures on each rod. A young angler said she didn't need a license because she was only 16. When asked for her birth date, the officer's math came up with 17 years. She admitted lying. If only the examples were isolated. Every week there are DNR reports of fish poaching that go beyond innocent one-fish mistakes. Often the violators have dozens or even hundreds of fish. These are not amateur fish poachers. On Lake Waconia, three anglers had 128 sunfish and were still catching more when stopped by a conservation officer. One of the three didn't even have a license. 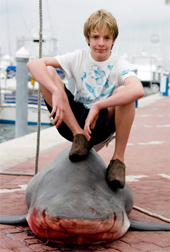 WEST PALM BEACH, Fla. (AP) - A 12-year-old Connecticut boy may be the new Florida state record holder for catching the heaviest bull shark. Aidan Murray Medley had a spent a half day at sea Tuesday when he reeled in the 551-pound bull shark just north of the Palm Beach Inlet. The seventh-grader at Eagle Hill School in Greenwich was in Palm Beach County on vacation with his family. They plan to submit his catch for a new state record. Florida wildlife officials say the current record set in 1981 was a 517-pound catch at Panama City Beach. BRISBANE, Australia (AP) - A snake has been saved by surgery after mistaking four golf balls for a meal of chicken eggs, a veterinarian said Wednesday. A couple had placed the balls in their chicken coop at Nobbys Creek in New South Wales state to encourage their hen to nest, Australian Associated Press reported. They took the 32-inch non-venomous snake to the nearby Currumbin Wildlife Sanctuary, where senior veterinarian Michael Pyne operated to remove the balls from the snake's intestine. "Those golf balls weren't moving any further; they were stuck where they were," Pyne said. "If it hadn't been found, it would have died for sure," he added. ANNAPOLIS, Md. (AP) - Police said a man was arrested after an officer found him in a store's bathroom with a $700 fishing reel stuffed into his pants. An employee of the West Marine store in the Hillsmere Shopping Center alerted an officer on Monday afternoon to two suspicious men. Police say Timothy Hamilton, 37, of Glen Burnie, locked himself in the restroom, where the officer found the fishing reel in his pants. Hamilton was charged with theft and possession of drug paraphernalia after the officer found a glass drug-smoking pipe under the seat of the Jeep that he had been driving. A passenger, Randy Coleman, 30, of Baltimore, was charged with possession of paraphernalia. One of Montana's most notorious poachers, Philip Mark Payton, once hunted moose and other trophy animals with impunity, but these days the only creature he says he's after is the mouse in his house. Two years after he was charged, Payton's victims - or rather their skulls, antlers and hides - stared at him mutely from the jury box Wednesday, providing a poignant backdrop in the sentencing of one of the worst cases of illegal killing of big game in decades in the Big Sky state. Prosecutors sought a lengthy prison term for Payton, who violated virtually every hunting law on the books, but he instead received a large fine and probation and had his hunting, fishing and trapping privileges revoked for life. He admitted killing the 30 animals he was charged with, but denied investigators' claim of brutality toward his victims. In the end, Judge John Larson rejected the prosecution's request for a prison term and sentenced Payton to 20 years of probation, including five years of intensive supervision and 1,000 hours of community service. Payton also must pay $52,744 in fines, restitution and court costs. He also was permanently banned from hunting, fishing and trapping or accompanying anyone in those pursuits in Montana, a prohibition that extends to 25 other states because Montana is part of an interstate wildlife compact. Payton also involved his family and friends in his poaching. Nine have pleaded guilty and received suspended prison sentences, temporary loss of hunting privileges and fines, restitutions and courts costs totaling more than $23,000. One suspect, Dean Hansen, a veterinarian in Frisco, Texas, remains at large. Payton said he shouldn't go to prison, in part because he needs mental health counseling for an obsession with hunting and medical treatment for prostate cancer. OHIO: Eight men from Ohio and Michigan who faced 257 charges centering on taking hundreds of excess walleye from the Maumee River during the last two spring runs have been fined and ordered to make restitution totaling more than $28,000 from Maumee and Perrysburg municipal courts. Ron Ollis, special operations supervisor for the division, said at least 570 walleye were involved in the charges linked to 20 days of spring fishing in 2006 and 2007. "As we find in all our cases, greed and egos took over and they overbagged excessively. No commercialization was uncovered in this group; they kept the fish for personal use. The Division of Wildlife also learned a great deal in this case about violation types and issues on the spring walleye run. We will work internally to tailor enforcement to the needs on the run." Those arrested included Thomas E. Crotinger, 51, of Dayton, who was described by wildlife authorities as the central figure and who faced 80 charges in Perrysburg and 30 more in Maumee. A state record summarizing his case dispositions shows he was sentenced after a plea deal on a total of 44 charges and was fined $11,000 and ordered to pay $1,100 in restitution. His Ohio fishing privileges were suspended for 10 years, and he was given a one-year suspended jail sentence in Maumee. Crotinger also was forced to forfeit an array of fishing equipment.